UPDATE: Motorola Xoom price to match Apple iPad 2 | What Hi-Fi? For what we can hope must be the last time, the UK price of the Motorola Xoom tablet has been 'confirmed'. The Android 3.0 sporting tablet will now cost the same as the iPad 2, selling at £480 for the 32GB wi-fi model and £580 for the wi-fi + 3G version. It's available for pre-order now at PC World, and you'll be able to read our in-depth review in the June issue of the magazine, on sale next month. PC World has just revealed UK pricing for the forthcoming Motorola Xoom tablet. On its web pre-order page it's asking £449.99 for the 32GB wi-fi model. 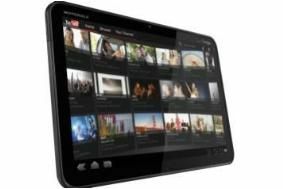 There's no concrete launch date yet, but that price undercuts the equivalent iPad by £60 – not bad for the world's first 10.1-inch Android 3.0 Honeycomb tablet, which supports Flash video, has a larger screen, dual core processor and stereo speakers. Apple is expected to announce details of the iPad2 tomorrow night at 6pm, so we'll be reporting live from the launch event here on whathifi.com. Join us then. Motorola has unveiled its Xoom tablet, complete with the 'Honeycomb' operating software aka Android 3.0. The first tablet to sport this newest incarnation of Android, a Xoom prototype was tucked away on the stand here at CES in Las Vegas. It certainly sounds the part based on the tech specs: there's a 10.1in display with a 1280 x 800 resolution, an HDMI output for 1080p video and a 32GB hard disk. There are two cameras for pictures and HD video, Wi-Fi, Bluetooth and 3G support, Flash compatibility and an SD card slot. It may have been a work in progress but the Android 3.0 interface certainly seemed fast and intelligent, rendering pages and apps in style. Details on a UK price and release are again sketchy but it should be a serious contender when it finally does arrive later this year.